In preparation for publishing the new online course this summer, I am delighted to offer the introduction to the course for all prospective students, absolutely FREE. You will receive an email confirmation, with a link to a PDSF containing the course introduction material. Six days over two months. This is followed up by a a further six months internship and self-study during which time written work and a final assessment (via Skype) with the course director will be required. We are delighted to be offeri ng Healing Space as a residential retreat in Italy from 20th – 25th April 2015. The retreat will comprise five days intensive training in a residential setting at Shanti Centre in Abruzzo. This is followed up by a a further six months internship and self-study during which time written work and online mentoring meetings with the course director will be required. The full cost for this residential course is 920 GBP. This includes all teaching and materials, accommodation and meals but does not include the costs of books or travel. Jude is delighted to be a hosting a session on Yoga for People Living with Cancer at Yoga and Health: Research and Practice. 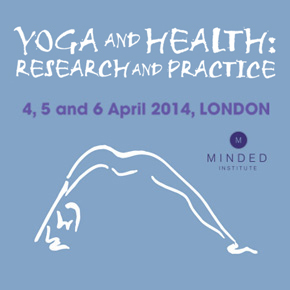 A prestigious international event being held in London on 4th, 5th & 6th April 2014.